Pegasus W1562-05B Pegasus W1562-05B 356BS FT0B/MD0A 2/3 needle chainstitch elastic lace attacher. 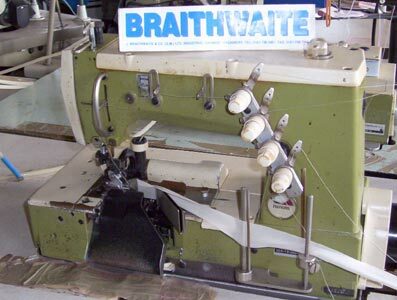 Twin needle chainstitch industrial sewing machine. With right lower side knife & top meter device. Hard to find model in Great condition. Top & bottom feed, good condition. Kansai special DFB 1402 Mr Twin needle chainstitch, set as standard double chainstitch etc. Good condition. Union special 59300 K16 Pleater Union special 53900 Twin needle flatbed chainstitch with 2:1 pleater assembly. Used in the bedding industry etc. 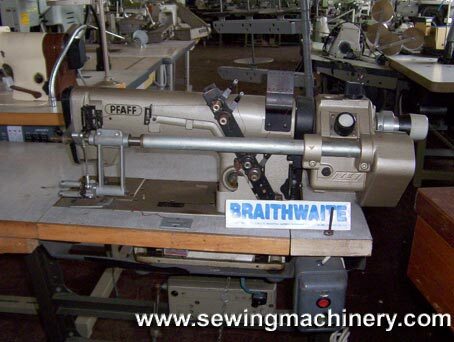 Pegasus / W & G WS42 -81 248 MD32 / RP1 Pegasus WS42-81 twin needle with front metre device & back puller feed device.